The Kids Club is a facility in which the owner is involved in all of the planning. The owner, Lana Eddins, takes pride in telling prospective parents about the longevity of her staff. She also is quick to list the ways that her school helps give parents multiple options for school age children while being fun for the kids at the same time. Much of this is due to her having helped design this facility and the staff who have worked at the school for years. Whether a parent is interested in the Private Kindergarten program or the before or after school program all are great choices for parents. Below is a list of the Kids Club staff with their length of employment and explanations of some of the zone areas at the Kids Club..
Do you want your child to have more one-on-one time to help them get ahead in Kindergarten? If so, then our program is for you. With a maximum of 12 to 1 student to teacher ratio, your child is guaranteed to get that extra attention! With a designated classroom, our half day program is one of the best around. During the school year, students with homework are immediately directed to the Concentration Station to complete homework prior to parent pick up. This station is also equipped with a selection of reading books and dictionaries. This room also offers the use of computers with parental access internet for children to do homework as well as the capability to submit it to their teacher. A fun place to enjoy an afternoon break. The Hang Out comes complete with a serving bar and fun diner tables to complete the Soda Shop theme. The perfect place to relax and cool off! With Stadium Seating and a large flat screen smart TV with surround sound, kids are able to take a break while watching a video from our large video selection. A great place to play while encouraging kids to use their creative minds to build things. Galaxy Construction is a definite favorite! With train track sets, legos, and much more, kids are constantly building new things every day! Let your imagination run wild! With our built in Art Zone, the activities are only limited to their imagination. With painting, drawing, and creating spaces, there is no limit to what they can create! The Amuzement Zone is a definite favorite with the kids! 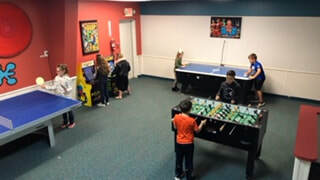 With an air hockey machine, a Pacman video arcade game, a foosball table, and a Wii, a Game Cube and more, this is a room that will exercise their competitive nature. Let your inner actor/actress run wild! In our drama club area, kids love to dress up and act to their hearts content. With a raised stage and lighting, they can create their very own plays! Rainy day outside? No worries, our Club Adventure zone is open for fun every day! Kids love to climb, slide and fly this plane no matter what the weather is like outside. And finally, if all the other zones that we have to offer are not enough, we have a huge outdoor playground area for all of the school age kids to exercise their energy!